I was born and raised on the south coast of Australia in the little sea side town of Thirroul. Great place! As one of four brothers we were never lost for things to do, and of these things one of my favourites was to work with wood. As our father’s trade was carpentry and joinery we had a great woodwork teacher and a fully equipped workshop right there at home. As the end of my school days arrived it seemed like a natural step to follow my father and older brother in their trade and so I became my father’s second apprentice. Very early on I realised I had an eye for detail and appreciated the finer and more challenging work. My great love for music, singing and playing guitar in several bands in the 80s, lead me to making my first instrument: a hot pink telecaster with black hardware, ebony fret board and pink dot inlay. It looked the part and played just as well, in fact it still has a place in my music room today. 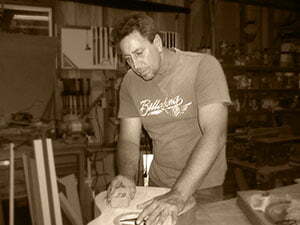 Since then I have made many guitars and gained a wealth of knowledge and experience. Time and patience have shown me how best to use the tools of my trade. This naturally helps in all aspects of guitar making, but especially when shaping the neck and fret board, or the fine bracing and tone arms under the sound board of a beautiful acoustic guitar. These parts have to be just right, or there is no point to the rest of the instrument. It’s this passion, knowledge and attention to detail that allows me to make a fine instrument each and every time and it would be my pleasure to craft a custom hand made guitar for you. For more information on Glenn please see Guitar Maker on the home page.